I have previously reviewed the Anker Roav Viva and liked it, it was great for voice control of my music (Amazon Music) and worked well for navigation too. There was one major caveat though, my car is a 10-year-old Corsa, I have a CD player and no other forms of input. That meant I needed a radio transmitter paired to the Roav Viva for it to work. This eventually led me to stop using the device, as I needed three USB ports, one for the radio transmitter, dash cam, and wireless charging mount. I did buy a lighter adaptor that had 4 USB ports, but it led to a mess of wires, so I had to get rid of the Roav. The Roav Viva Pro addresses this issue by adding in a radio transmitter. It is currently priced at £49.99 on Amazon, making it just £4 more than the older model and well worth the extra if you need that FM transmitter. 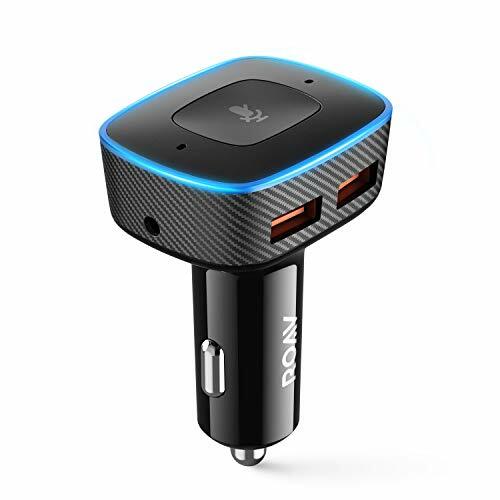 If you are not familiar with Roav Viva, it is a small two USB port adaptor that uses microphones and an app to provide Amazon Alexa functionality inside your car. The device itself merely provides an interface between you and the phone for Alexa, so the two integrated microphones pick up commands, transmit via Bluetooth and your phone does all the hard work. ALEXA INSIDE: Amazon's voice service gives you complete voice control in your car. Just say the word to get directions, ask Alexa to read an Audible book, shop online, play music, and more. Spotify feature will be added as soon as third party support is available. EXTENSIVE CONNECTIVITY: Use in virtually any car by connecting via Bluetooth, Carplay, Android Auto, AUX-Out, or FM transmission. Set up was quick and easy. With my car being limited to FM radio, this is the option I went for, but you can also USB, AUX and Bluetooth. You will need the Roav Viva app, and you will need to sign up to the service like most apps. From there you choose how you want to connect, follow the instructions, connect to Alexa, and away you go. With the FM radio option, you will be greeted with three default stations to transmit to, but you can assign your own. I went for 88.1Mhz as it was close to the one, I was already using. As I have already said, this device addresses the biggest issue I had with Roav Viva. I would guess that a large percentage of people looking at this product have a car that is a little older and doesn’t necessarily have the options to connect media that newer cars do. So, the FM transmitter makes a lot of sense to me, and it has finally brought my cars media system to the modern era. I probably got lucky with the radio station, but I have found considerably less interference with the Roav Viva than the previous dumb transmitters I have bought from Amazon. It is not perfect, sometimes there is a bit of a hiss, then other times no noise at all. Any music drowns it out. My old one had a high pitched static audible regardless of music volume. All the great bits from the previous Roav Viva review still count, I feel like the microphone is more accurate, I have had fewer issues with picking up my voice, even driving down fast country roads with both the music and heating on. The vast majority of my use is for music and maps, and it does this well. Alexa on this is not compatible with Spotify, but I have found Amazon Music to be good enough, and quite often I will just manually start a Spotify playlist before I drive off. Getting directions from Google maps is superb, I have asked it several times for directions to a business, Alexa will look it up, confirm the business name and address, and load up Google Maps and auto start it. I loathe speaking on the phone, so never bothered about answering the phone while driving before. However, I did get to experience it for the first time with this. It was Amazon calling about delivery, so I didn’t want to miss it, and it worked flawlessly, as you would expect. The call came through the speakers, and the person on the other end understood everything I said. Similarily you can make calls in the same manner as the old Viva, but there is no SMS. It is not all perfect, there are clearly limitations of how Alexa can interface with your phone, as Alexa is normally used on a static speaker with Wi-Fi. The past two days when I left an office I was temporarily working at, my phone still had wifi but not enough for signal for the internet to work. Therefore, Alexa would not work. My phone will switch to data when it notices, but there is a big delay. This is not a fault of the Roav Viva, just an issue that is inevitable occasionally. As stated before, Roav Viva does not work with Spotify, which is a significant downside for me. It seems to be common on third-party Alexa devices, the UE Megablast had the same problem. I suspect this is an API issue on the side of Alexa/Spotify. Amazon Music does work fine, but I only ever use Spotify when I have the choice. Not a huge issue, but obviously another limitation of Alexa. When I was using Google maps, I wanted to switch it off when I was near home. Alexa could not do this, and I had to hit the X on Maps manually. It is only a small quirk, but I suspect Alexa will stumble over these things occasionally. For me, due to the radio transmitter, this is considerably better than the previous Roav Viva. It is obviously not cheap, but it is much better value for money than the older model and only £20 than the very well-reviewed, Anker Roav SmartCharge which lacks any AI assistant. At a fiver more than the none-Pro model then this is easily a better buy. While Alexa isn’t flawless, it does work very well, and I love having the option to control my phone via voice whilst driving. More importantly, it takes away the temptation of using my phone to pull up directions, or change music, so it is considerably safer. For older cars with no USB or AUX, this is considerably better than the original Roav Viva and only a fiver more.